#10 Best men’s watches under $100 in 2019. Not only can you find a watch you like for under $100, you can find stylish and quality men’s watches in that price range, too! The wide range of men’s watches on the market can be intimidating – particularly if you’re not familiar with all the types of watches and their technical specifications. The situation gets even more complicated if you’re on a budget. At one point, you might think that there’s no way you can get a high-quality watch at a decent price. Still, irrespective of the price, a watch is a unique accessory, perhaps a style emblem. That is primarily why you should put a lot of thought into purchasing the right one. You shouldn’t feel discouraged, even if you are on a budget. As a matter of fact, we’ve made a list of top ten budget watches for men under $100 that are surprising both in terms of style and performance. And while pricier options on the market have a better quality from more well-known watch brands, this doesn’t mean that our recommendations aren’t worthy of your attention. Take the time to assess which of the products best suits your style, needs, and budget, and you’ll be on the right path. Here’s a quick overview and comparison table of the top 10 best men’s watches under $100 in 2019 that we take a closer look at on this page. 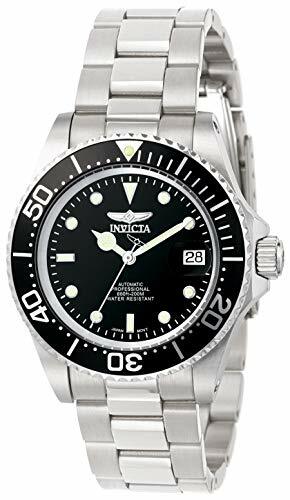 For watches in this price range, Invicta Men's 8926OB Pro Diver Stainless Steel Automatic Watch is definitely worth considering. The steel casing guarantees its durability, and the design is definitely eye-catching and stylish. That makes it the perfect fit for you if you’re looking for an elegant watch. Truthfully, Invicta watches offer great value because they combine functionality with performance and aesthetic appeal. And this item makes no exception whatsoever. Moving on, it has a mineral dial window. This ensures visibility. What is more, the watch benefits from the Japanese Quartz technology, having an automatic touch to it. That is to say, it uses the kinetic energy generated by your hands’ movements. The unidirectional bezel with clear hand markings of the hour, minute, seconds and date come in handy, as well. On the other side, the watch is prone to go off when you’re not wearing it. This is due to its automatic nature. Plus, according to reviews, it might be too small for some men. Our verdict of Invicta Men's 8926OB Pro Diver Stainless Steel Automatic Watch. Essentially, this would be a great watch for whoever appreciates the functionality and the stylish touch of the item. 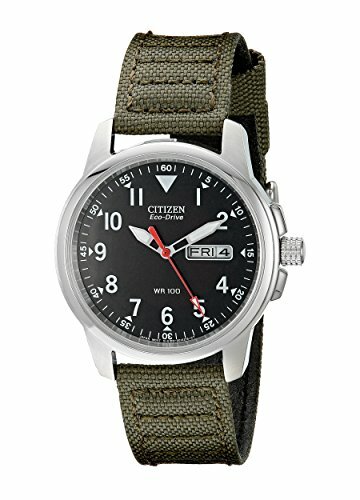 To start with, Citizen Men's BM8180-03E Eco-Drive Stainless Steel Watch is a great watch that comes at a fantastic price. It has a modern, minimalist design that goes perfectly with every outfit. Still, I’d have to say that this is the go-to watch for the casual man. This item doesn’t have unnecessary bling or additional fuss – which grants it a classy look. Obviously, this also makes it wearable. Additionally, the Japanese Quartz movement does a decent job. That is to say, if you don’t require atomic timekeeping, you won’t be disappointed by this watch. At the same time, the fact that you don’t have to change the batteries offers great convenience. On a different note, this item features high-quality luminescence material. In other words, you won’t have any trouble with telling the time in the dark. While it’s true that it isn’t as intuitive as other pricier watches, its performance is still decent. The main downside of the watch is the canvas band. At first, it is quite stiff and uncomfortable. What is more, it tends to retain water, not to mention that it runs small. 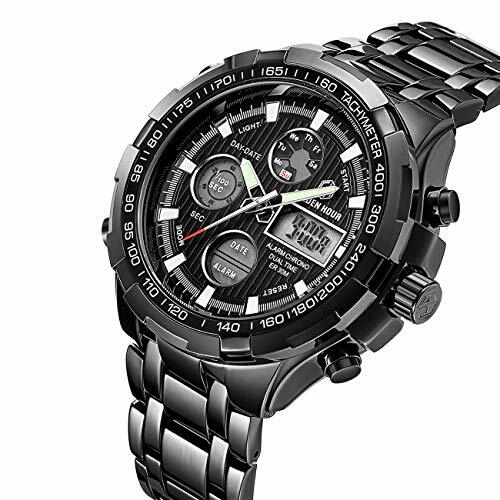 Our verdict of Citizen Men's BM8180-03E Eco-Drive Stainless Steel Watch. On the whole, this watch is well worth the investment. Plus, if you get it on Amazon, there are occasional discounts you can take advantage of. 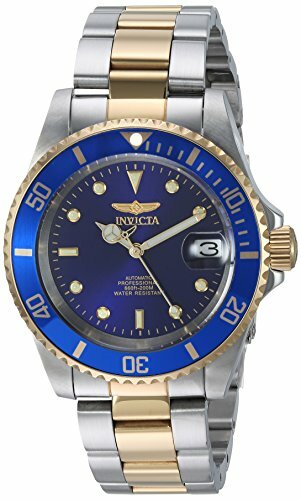 It’s difficult to find a watch that looks as stylish as Invicta Men's 8928OB Pro Diver Gold Stainless Steel Two-Tone Automatic Watch within the same price range. As a matter of fact, this is one of the best dress watches you can find if you’re on a budget. Essentially, it is a replica of the popular Rolex Submariner. Still, it is tastefully done, in the sense that it looks impeccable. It is stylish, as you can see in the picture, fairly accurate, and it doesn’t cost as much as a car. The bracelet is also comfortable. Plus, if needed, you can remove the links yourself, since it is super easy. The only negative thing I could think of is the inferior lume – which is quite weak. Nevertheless, for the price, it is fairly acceptable. Additionally, the band is prone to get scratched, especially in contact with harsh surfaces. So, you should be careful in this respect. Our verdict of Invicta Men's 8928OB Pro Diver Gold Stainless Steel Two-Tone Automatic Watch. this watch will suit your expectations if you’re looking for a high-quality, affordable watch. While it might not be the most durable item out there, it is a good investment, given the price. 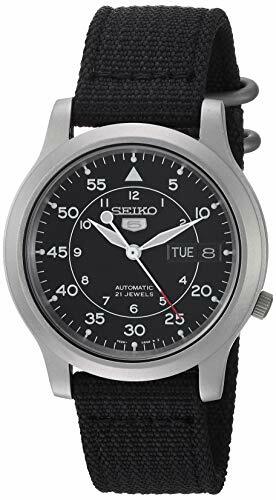 While it would be too much to say that this watch feels premium, Seiko Men's SNK809 Seiko 5 Automatic Stainless Steel Watch does have a solid construction. As a matter of fact, Hardlex is a material that is exclusive to Seiko and its subsidiaries. This material is surprisingly durable – even more durable than standard mineral crystal. At the same time, the mat finish looks great – in my opinion. Plus, an additional benefit would be that it also safeguards the watch from any sizeable marks or scratches. Still, this doesn’t mean the watch won’t get scratches as you wear it on a regular basis. As for the 7S26 automatic movement, it is pretty basic, yet durable and reliable. The standard deviation ranges from 20 to 40 seconds per day. That is to say, this watch can be out by up to one minute a day. Also, if you have bigger wrists or arms, you may find the watch a tad too small. Our verdict of Seiko Men's SNK809 Seiko 5 Automatic Stainless Steel Watch. Incredible value for money and it’s one of the lowest priced automatic (non quartz/battery) watches you can find in this price range. 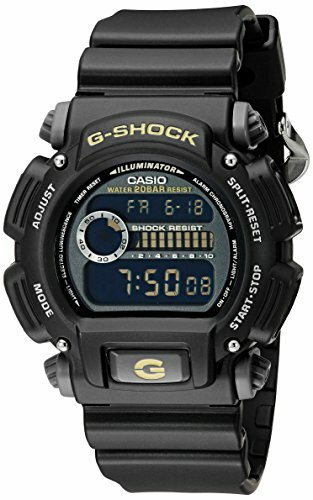 We’d like to start off by saying that Casio Men's G-SHOCK - The GA 100-1A1 Military Series Watch is the perfect match for the active person. In other words, this is a tough watch that can put up with the treatment associated with an active life. While the design is quite basic, it has a professional appeal to it. The all-black casing looks sleek, especially in contrast with the white index hands and indicators. In order to configure the display, you should know that you can find all the information you need on Casio’s website. Thanks to the cutting-edge anti-magnetic structure, you can rest assured that the exposure to magnetic powers won’t affect your G-shock. The fact that you can choose from 29 distinct time zones is also a pro. Nonetheless, as a negative aspect, you should know that the illumination system is poor. So, you won’t be able to read the hour in dark environments. Of course, this is also due to the use of the black shade. 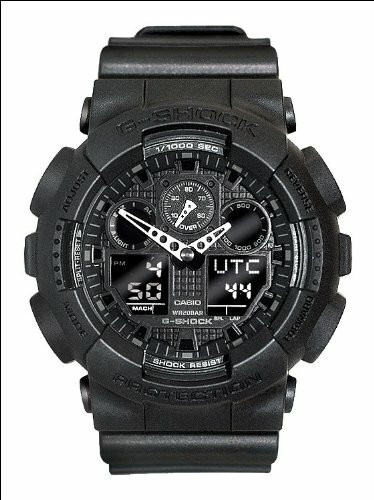 Our verdict of Casio Men's G-SHOCK - The GA 100-1A1 Military Series Watch. All in all, if you need a watch than can match your active lifestyle then you cannot go wrong with this watch – especially for the price tag. To start with, Casio Sport Watch is a solid, well-made watch. It was made to withstand regular and heavy-duty use. If you have broken several watches that weren’t durable enough for you, the odds are that you’ll find this one to your liking. Not only that it is durable, but it is also comfortable to wear – which comes as another advantage. At the same time, it is accurate, meaning that you can depend on it to tell the time. While we cannot say that this watch doesn’t look good, you don’t necessarily wear it because it’s stylish or fashionable. You wear it because it is tough and reliable – which is the best thing about it. Still, if your wrist is skinny, you might find it too large. Another downside could be that the alarm goes off after a few seconds, which could be a bit inconvenient. Measuring roughly 45mm in diameter, Citizen Men's Eco-Drive Stainless Steel Watch is a stainless steel watch that has a mineral window. As for its width, it is of 50mm – which means that if you’re on the lookout for a small-sized watch, you should look elsewhere. We personally find this watch to be beautiful and elegant – having a unique retro appeal to it. It is water resistant, meaning that it can survive everyday activities such as showering, swimming, washing your hands, so on and so forth. The back of the case features a globe, which outlines the aviation theme of this beautiful watch. One of my favorite aesthetic aspects is the dial. That’s because it has several concave layers. Moving on, the watch uses a Japanese Quartz Eco-Drive J810 movement. You might already know that Eco-drive is renowned for drawing power from all types of power sources, aside from sunlight. That is to say, this watch can run no less than six months on a single charge. Not to mention that you benefit from a 5-year warranty. A minor downside might be the thickness of the band, which makes it a bit uncomfortable. That also makes it difficult to strap it through the buckle. Also, as long as you’re comfortable with wearing a large watch, this one is a decent pick for the price and quality. There is a reason why this beautiful watch is referred to as The Minimalist. That is due to its striking aesthetic appeal. Fossil, as a brand, tends to create watches that are all about simplicity and sophistication – and the same applies to this item. 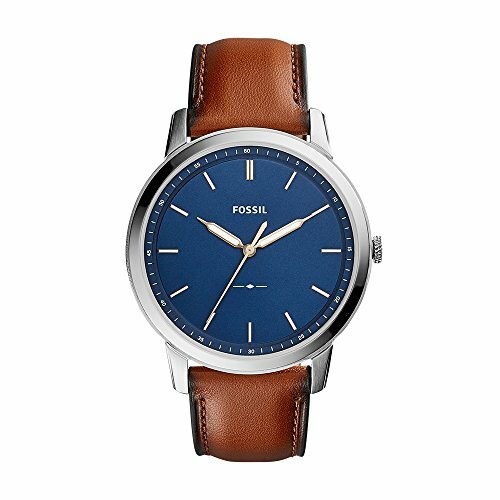 The Fossil Men’s The Minimalist combination of the thin, delicate profile with the large diameter is remarkable. Moving on to the water resistance rating, the watch should withstand recreational swimming. However, we wouldn’t recommend go swimming with it – especially since this is a dress watch. At the same time, the leather strap shouldn’t be submerged in water. The dial design is just as minimalist and neat as you’d expect it to be. The color combination is also beautiful and classic. As for the leather strap, it looks really attractive. Both the buckle of the strap and the tang are made of identical black stainless steel – as the case. Also, the watch is equipped with an Analog quartz movement, which offers a decent performance overall. Ultimately, the 2-year limited warranty offers peace of mind. Our verdict of Fossil Men’s The Minimalist. In short, this is a minimalist, sleek watch created for the modern gentlemen. We love the striking aesthetic appeal of this dress watch! If you’re on a budget, and you want to get a sturdy, versatile watch, Tamlee Luxury Full Steel Analog Digital Watch will be right up your alley. The good thing is that you can fully adjust it, thanks to the tool that comes with the watch. This means you can get the perfect fit. Nevertheless, you should note that it is rather heavyweight. Plus, it looks a bit bulky – so, if you don’t like this style, you should pick another item. Also, you should note that the numbers are a bit small. And this makes them difficult to read. Plus, there are some technical details that might be regarded as disadvantages. For example, the analog display on the watch tends to run faster than the digital time display. Our verdict of Tamlee Luxury Full Steel Analog Digital Watch. On the whole, this is an affordable purchase, and the watch is well made for the price. Nonetheless, it isn’t for everyone, so take this into consideration before making a purchase. Essentially, the main thing that catches your attention when it comes to SANDA Men’s Watch With Auto Date Chronograph is its looks. It has an industrial, modern appeal that makes it a great accessory for most outfits. Of course, the convenient price point is a perk as well. Additionally, the watch comes with a tool you can use the change the length of the band. So, this means that you can wear it no matter if your wrist is small or large. It’s worth noting that the model is unisex – this means it could be a bit too small for some people. However, this depends on your taste. Nevertheless, considering the low price point, this isn’t the most durable watch on the market. That is to say, it won’t last you for years. Plus, some people outlined that the timekeeping isn’t quite accurate, which is another disadvantage. Here in the next part of the article, we’d like to cover the most important aspects that will help you buy the best watch. This way, you can make a fully informed purchase. Is Buying a Men’s Watch Under $100 Even Worth It? Getting an affordable watch is totally worth it. And this applies especially if you’re on a budget. Essentially, not all people intend to spend a considerable amount of money on a watch – and this makes total sense. At the same time, as you can see from our selection of budget-priced watches, there is plenty to choose from. In other words, there are watches under $100 that come in various styles. Nevertheless, this doesn’t mean that investing in a more expensive watch isn’t worth it either. As a matter of fact, the more you spend on a watch, the more durable it will be. So, it’s up to you to prioritize and determine what works best for you – getting a budget watch or saving up for a pricier men’s watch, from a more well known brand. When shopping for watches, you’ll hear a lot of info about watch movement. And this refers to its inner mechanism. Its movement is essential as it affects the way in which the watch works, and its accuracy. We could say that a watch’s movement is its heart. No battery – A mechanical watch works due to a hand-wound mainspring. This means that you don’t have to worry about replacing the battery. When it stops ticking, you simply wind it up. Tactile operation – The fact that a mechanical watch must be hand-winded is unique and appealing to watch enthusiasts. Unique character – The work and engineering directed into the creation of a mechanical watch is impressive. And this is what grants mechanical watches a unique character and charm. Sleek hand movement – In contrast with the tick, tick that is specific to the quartz movement, the sound produced by a mechanical watch is more pleasing. Regular winding is necessary – While some people might enjoy winding the watch, for others, this might be an inconvenience. More expensive – Because of the craftsmanship and work that goes into manufacturing a mechanical watch, it is pricier than its counterparts. Not as accurate – With age and use, a mechanical watch’s accuracy will diminish. Sensitive – A mechanical watch works due to an assembly of complicated springs and gears. This is why its movement is sensitive to moisture, dirt, big bumps, and the list may go on. No battery required – Similar to mechanical watches, automatic watches are powered by a mainspring and complex gears that move the watch hands. Hence, they are also called self-winding watches. Character – The manufacturing of an automatic watch is complex and impressing. This grants it a unique character. Smooth movement – Automatic watches release a smooth, pleasant hand movement. Convenient – Since they don’t require winding, they are more convenient than mechanical watches. Less accurate – Over time, automatic watches lose their accuracy, requiring tune-ups. Expensive – Attentive engineering and manufacturing don’t come at a cheap price. High-maintenance – Even though an automatic watch doesn’t necessitate winding, if you don’t wear it regularly, you should store it in a watch winder. While watch winders aren’t necessarily expensive, they make an automatic watch more high-maintenance than others. Sensitive – Automatic watches are susceptible to environmental factors. Affordable – Quartz is the most conveniently priced watch movement. And this is a major advantage. Accuracy – In contrast with other movements, it is the most accurate, because it uses electricity from a small battery. Durability – Watches powered by quartz movement are the most durable, meaning that you can wear one at work, without worrying that it’ll get ruined. Convenience – A quartz movement watch requires less maintenance than other watches. All you have to do is change the battery every now and then. Noisy operation – The staggered movement specific to the quartz movement isn’t as smooth as the one of an automatic or mechanical watch. Lacks the character of other movements – Quartz movement watches are modern, and they lack the charm associated with other types of movements. As you already know, there is a wide range of watch types designated for men. We’ll outline the main ones. Dress Watch – Similar to a jewelry-like timepiece, a dress watch is also an accessory. Usually, this type of watch features a minimalist design, with a simple dial and a neutral color palette. Also, it has a leather strap, which is typically so thin that it could go unnoticed. Fashion Watch – This watch is designated for everyday use. In other words, it goes perfectly well for both informal, casual occasions and special events. Concurrently, it combines style with functionality, which makes it quite versatile. 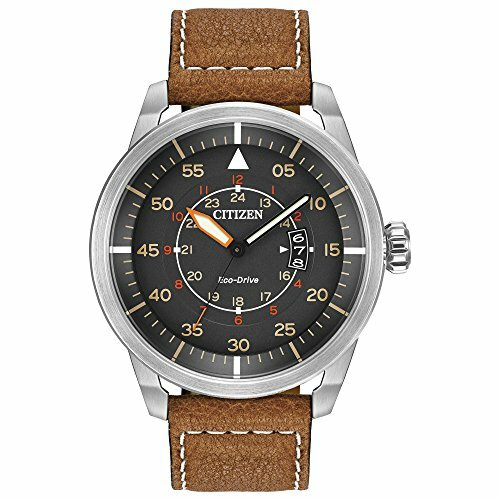 Aviator Watch – Also referred to as the pilot watch, a distinctive characteristic of this item is the bezel and side rule. Before electric navigation became the norm, these characteristics were of great importance to pilots. Simultaneously, aviation timepieces feature luminous numerals and dials. That’s because aviators would use them in the dark, as well. Driving Watch – The driving watch is the essence of speed and masculinity. Thus, it tends to have a complicated chronograph. Also, these watches have additional buttons on the side, an aspect which makes them visually appealing. Diving Watch – As the name already implies, a dive watch is meant to withstand water. That’s why it has a durable construction, a unidirectional bezel and luminous dials and hands. It should also inform the diver of the immersion time he has left. Smart Watch – Essentially, this is a mobile device that is designed to be worn as a watch. Not only that it tells you the time, but you can also use it for apps, making calls and the list may go on. Skeleton dial – Having a watch with a skeleton dial means that all the moving parts are visible, creating a unique look. Water resistance – You should always check a watch’s water resistance rating to determine what works best for you. Date, day and calendar display – Most watches give you information regarding date, day and time, depending on the make. 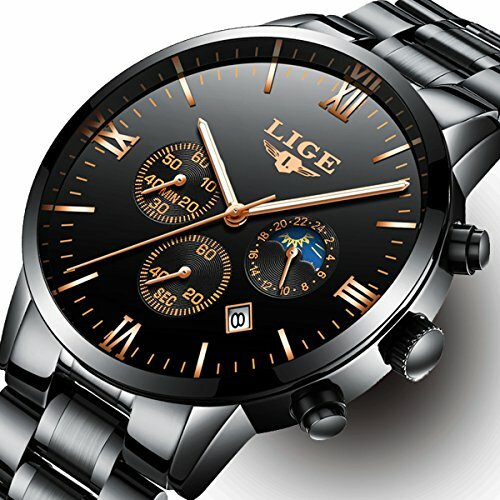 World time – There are also watches that tell the local time and the time in other zones. Light – Lume is used to describe the luminous phosphorescent solution on the watch dials. This allows you to tell the time in the dark. Alarm – There are some watch makes that have alarms – if this feature is important to you, you should consider it in during your search. Stopwatch – Essentially, most sports watches come equipped with a stopwatch, which is useful for sports activities, in particular. Tachymeter – A tachymeter is used to measure speed, and most chronographs feature this characteristic. Heart rate motion – Smart watches can monitor your heart rate. This feature gives you a better idea of your heart’s activity. Movement – Essentially, a watch’s movement is a decisive element in its performance. Make sure you review the elements we outlined beforehand. How to Select the Best Strap and Clasps? Another essential aspect that you should keep in mind is the way in which a watch’s strap looks on your hand. Essentially, the size should be well-proportioned to the wrist and hand. If it’s too big, it will stand out; if it’s too small, you’ll look as if you’d be wearing a lady’s watch. Aside from the size, there are various styles and materials to choose from. If you’re into classic, elegant timepieces, a leather strap will suit your style best. On the other side, if you’re into sports watches, a green canvas strap or a stainless steel strap will be better fitted. After all, it all comes down to this: choosing the option that best suits your style. How to Choose the Best Men’s Watch for You? After reviewing the most important parts of the watch shopping process, I’d have to say that your personal style should be your first guidance. We all have different preferences, which is why there’s no such thing as the best watch for everyone. That being said, take the time to analyze your fashion style, lifestyle, and of course, your needs. For example, if you work in a rough environment, investing in a day-to-day dress watch doesn’t make sense, unless you plan on wearing it only on special occasions. So, if you want a watch for everyday use, a more durable design would be better for you. Of course, your budget, wrist size, and needs should dictate your purchase, as well. So, make sure you take these elements into consideration. After reading this comprehensive guide, we could say that you are able to make the right purchase. Whether your budget is $30 or $100, you’ll definitely find something that can address your needs – as you can see from our list of recommendations. Ultimately, make sure to invest in the men’s watch that best fits your taste, needs, and budget. This is the key to getting the most out of your purchase. Last updated on January 7, 2019 .